On Valentines Day 2017 in Davenport, California, USA, main beach. The weather conditions were very rough and ocean conditions were dangerous from winter storms. 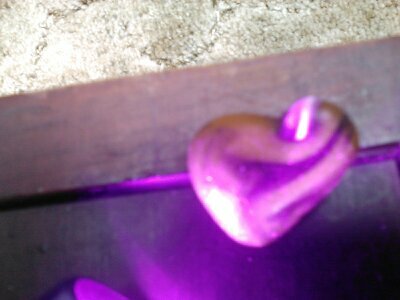 This orange, red, and yellow ultraviolet Heart is just amazing. I David Pickens am the proud finder of this piece and took the photo with my cell phone camera. NOTE: This photo was originally submitted to the photo contest. However, due to being the photo being so blurry we have moved it to beach reports.